The original Dodge Challenger was a late introduction to the United States pony car market, and was first launched in the 1970 model year, as a direct competitor of the Mercury Cougar, and derived from the Plymouth Barracuda, though it was two inches longer and had completely different lines. Following the recent trend of retro-muscle cars being re-imagined, the 2008 Dodge Challenger, which will be released later this year, joins Ford's redesigned Mustang and Chevy's upcoming 2009 Camaro as a modern muscle car. The concept form of the 2008 Challenger debuted at the 2006 Detroit Auto Show, and since then it's earned a fair share of buzz both online and in print media, garnering more than a few magazine covers along the way. Dodge is clearly hoping that this Challenger will give its performance image a boost. Based on the same platform also being used for the Chrysler 300 and Dodge Charger Sedan, a modified version of the Chrysler Group's LX platform, the initial Challengers will be offered with rear-wheel drive, and only one choice of engine: a 6.1 liter Hemi V-8 that pushes out 425 horsepower in cars where it's already in sue, like the Charger, Magnum, and 300. While Dodge is clearly intending this to be a limited edition vehicle, critics worry that limiting production to one engine design may hurt sales, especially since the competing Ford Mustang and planned Chevy Camaros both offer V-6 options. 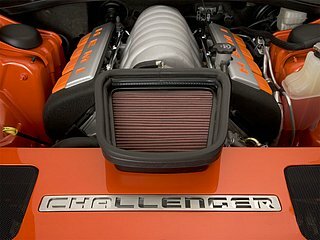 While there is only one engine, purchasers of the 2008 Dodge Challenger will have the option of either a six-speed manual transmission, or a five-speed automatic, which will combine with the 6.1 liter engine and comparatively low curb weight to allow acceleration from zero to 60 mph in under 5 seconds. As well, it's got fat tires supporting it's modern suspension system, antilock brakes and an aggressive anti-skid system. 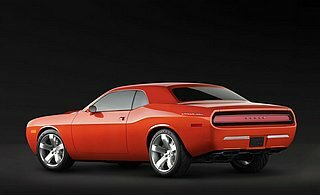 Cosmetically, the 2008 Challenger stays true to the original car from the '70's, with a nose and tail taken directly from the older car, and sides that are reminiscent of the Barracuda from the same year. As well, this vehicle is a true hardtop - there are no central roof pillars - and Dodge doesn't seem to be planning a convertible version. Inside the car, which comfortably seats four people, the black upholstery is a lean contrast to the bright orange exterior, though it is accented with silver, as well as narrow bands of orange on the seat backs. Principal interior designer Alan Barrington even cites the 1970 model as a source of inspiration, telling reporters last summer that, "…we wanted to capture the memory of that car, but expressed in more contemporary surfaces, materials and textures." What they wound up with is an instrument panel that sits high in the car and is intersected by a cluster of three circular gauges, and a fourth, larger gauge (really a computer display) that allow the driver to monitor overall speed, quarter-mile speed and time, and the top speed for each gear. Those in the know say that the production vehicle of the 2008 Dodge Challenger looks exactly like the concept car, inside and out. Dodge's website has a link to information about the auction of the very first Challenger, but the rest of us will have to purchase one. The starting MSRP, at your local new car dealer, ranges from $37,320 to $40,095. 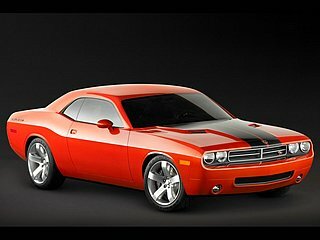 How do you like the modification of 2008 Dodge Challenger ?